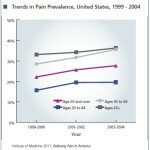 Most people with advanced cancer report pain--60% to 85%. Silver BookMost people with advanced cancer report pain–60% to 85%. Most people with advanced cancer report pain–60% to 85%.